With the invaluable support of Akbank Sanat, Sabancı University Sakıp Sabancı Museum is preparing to host “The Sky Event”, a series of conferences and art performences bringing together art, science, technology and architecture on October 23-24, 2015, in conjunction with its latest major exhibition titled “ZERO. Countdown to the Future”. “The Sky Event” was organized parallel to the revolutionary principles of the German art movement ZERO, which combined cutting-edge technology with art, and will bring together notable names of the art world both in Turkey and the world to discuss ZERO in a variety of aspects. “The Sky Event” will also include an unforgettable performance of the late ZERO founder and Director of Massachussets Institute of Technology (MIT) Center for Advanced Visual Studies Otto Piene’s open-air sculptures, “Inflatable Objects”. On October 23, Friday at 14:00, “The Sky Event” will kick off with a series of conferences on the present and future of the ZERO movement by art critic and curator Beral Madra, MIT faculty, artist and the late wife of ZERO founder Otto Piene, Elizabeth Goldring Piene along with Laura Knott, who has contributed to curatorial studies as part of the MIT Museum, and Mark Wigley, Dean Emeritus of Columbia Graduate School of Architecture and curator of the 2015 Istanbul Design Biennial. “The Sky Event” will conclude on October 24, 2015 at 14:00 with a performance of Otto Piene’s “Inflatable Objects”, created in line with his “Sky Art” concept conceived in 1969, led by a group of artists and volunteer students. With the open air sculptures released up in the air in Sakıp Sabancı Museum’s terrace in Emirgan, the Bosphorus sky will be transformed into a limitless canvas. “Sky Art”, which stands as an extension of ZERO founder Otto Piene’s academic work at MIT throughout his career and his art practice combining art, science and technology, constitutes a reinterpretation of the artist’s shattering experiences of World War II. With the idea that the sky, which was the backdrop of night raids and bombings during the war, may be transformed into the biggest canvas imaginable, ripe for new and positive possibilities, Otto Piene conceived the notion of “Sky Art”, saying: “The enjoyment of the sky was replaced with fear during the war. 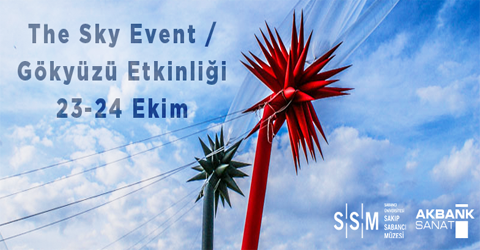 When the war ended, the joy arose, the impulse, to celebrate the sky – and with that, sky art as well.” In this way, “The Sky Event”, which will take place at the Sakıp Sabancı Museum on October 23 – 24, will meet students and art enthusiasts as a celebration of knowledge and hope, as well as constructive, hopeful wishes to the future.